​The beep of a smartphone. The click of a keyboard. The swipe of a card. With ACN, these are the sounds of your success. 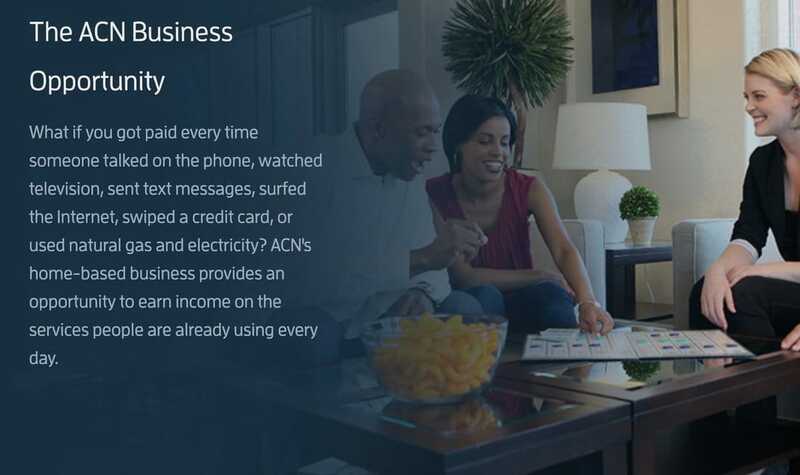 As an ACN Independent Business Owner, you connect your customers with the services that connect them to their world. Essential services like wireless phone services, High Speed Internet, television, home security, natural gas and electricity and more. Build a home-based business with global possibilities - with ACN, risk is low, potential is limitless and success is defined on your terms. When it comes to making a difference, there's power in numbers. That is why ACN has partnered with Project Feeding Kids to help end childhood hunger. Each time someone becomes an ACN customer, a child gets a meal. And every month when that customer pays their select* monthly service bills another child gets meal. "Your Office is wherever you are"
​....but just on the paying side of it.."
If people knew they have the freedom to pay less on your current bills, or even have their current services for free*, it would change their lives"